Should we let our cat out in winter? The question should not sound less interesting, even if the answer may appear as obvious: a cat that has the chance to go out should be let unlocked. Yet the freezing temperatures may bring forward some sorts of risks, and it would be wise to take some measures to keep your cat alive and kicking. The animals are naturally equipped to resist the cold: the fur is a barrier that retains body heat and repels water. Thus, even without clothing, the animal is able to face the winter. Moreover, the density of the coat evolves during the year: denser in winter, there is a fall of hair after the beautiful days. This adaptation is also done during the life of the animal: a cat that lives indoors for example does not undergo this annual cycle, and loses its hair all year round. The body is able to get used to the rhythm of life of the animal, and the one that is subjected to harsher temperatures will have a hair more dense and will withstand the cold better. Moreover, the cat knows how to protect himself from the cold by finding shelters: he chooses often resting places which are isolated. He will have no hesitation in staying home if he does not judge the weather to his liking: the cat is often seen spending more time indoors in the winter. It is therefore rare to observe lesions due to cold in a cat with a family. Does my cat like to stay warm and fear the cold? So the animal is naturally adapted to the cold, and the cat tends to select the environment that seems to him the most comfortable. He will therefore be able to regulate himself in relation to his sensitivity to bad conditions. Moreover, as an independent animal, its ethological needs often correspond to a certain freedom of movement. So a cat accustomed to going out will suffer more from the lack of activity than the cold if it comes to be locked up. The simplest is to offer the cat different rest areas inside and outside. The cat will select according to his needs those that suits him, and this may change during the seasons: a small shelter or a niche not far from the entrance will allow the cat to wait for the opening of the door to the door. free from drafts. Feel free to give him free access to these areas, so he is sure to find different shelters when needed. The cat flap is the most convenient for him, assuring him total independence. In the end, as a ritualised animal that does not appreciate change, it is best to offer him what he used to know during his lifetime: an outdoor cat will suffer from lack of activity indoors , and conversely, the indoor cat will not tend to demand passages outside and may even be chilly or frightened if it opens the door. 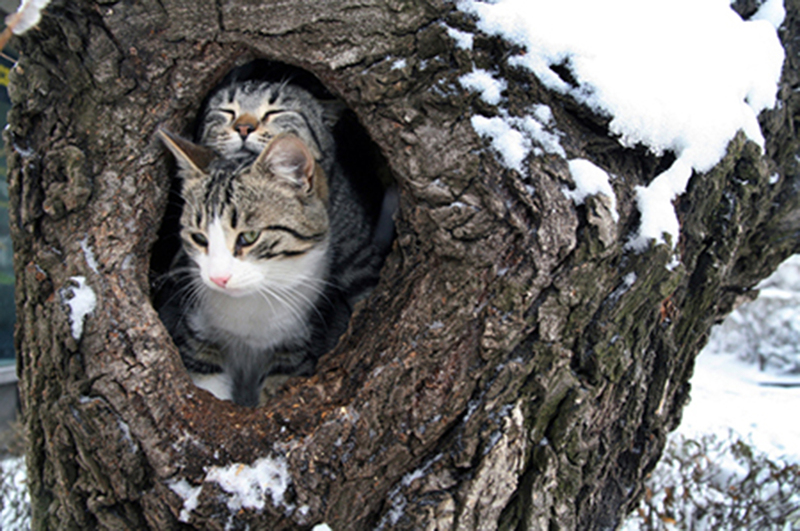 Does staying outside in winter present risks for my cat's health? The cat is not especially sensitive to a particular disease during the winter. Like us, it has a weaker immune system with the cold and it is a riskier time for infectious diseases, but there are no particular diseases that are specific to this season. In terms of the measures to be taken, unlike dogs, it is not possible to directly protect the cat against the cold with a garment. It may not tolerate the presence of the mantle. Beware of the return of winter for fleas, there is frequently a peak infestation around October / November, at the end of the active period of fleas. For cats treated during the summer, it is advisable to extend the preventive treatment until the end of autumn and the beginning of the cold weather. If frostbite appears, it is possible to cover them with petroleum jelly, which forms an insulating barrier against frost (to be used especially for pads in very cold weather, and risk of frost). In practice, this type of lesion is rare, typical of extreme cases.